This week on The Shire has been a busy one. We put up our second cutting of hay and the barn is full and we're ready to feed two cows for the winter. Again we have something new for everyone, this week we have our late summer specialty Melons! We also have the last of the Summer Squash. Many of the fall planting vegetables are beginning to be ready so we also have many of our spring crops cycling back into production like Lettuces and Arugula. Unfortunately our Tomatoes in the Greenhouse have succumb to the blight, and this will be the last week we have tomatoes, which has been a heartbreak for Sara as I am sure it has been for all of you. 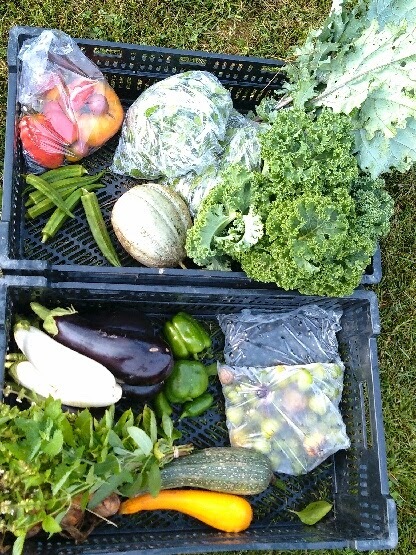 Arugula, eggplant, garden huckleberry, kale, melon, onions, peppers, summer squash, tomatillos, and tomatoes. 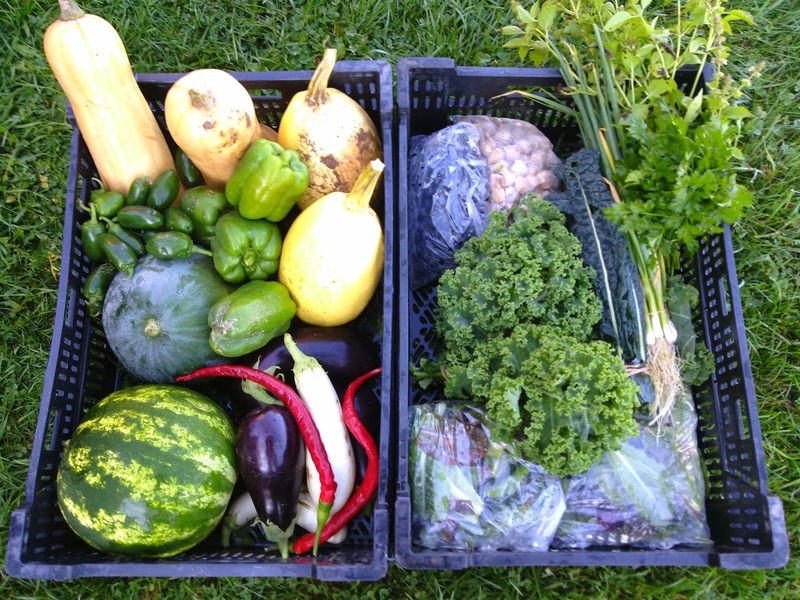 WE WILL HAVE A LIMITED AMOUNT OF EXTRA PRODUCE FOR SALE AT DROP OFF, THE FARM STAND AND CARSON CITY FARMERS MARKET! NEW THIS WEEK! These are a mix of Cantaloupe, and the small melon with big flavor, the Charentais Melon! We will have watermelons in the next few weeks so keep looking forward to that! To prepare the fruits for use in most recipes, it's necessary to subject them to heat (to soften them) and to add about 1 1/4 cups of sugar for every four cups of raw berries. [EDITOR'S NOTE: Sweetness is, of course, a matter of personal taste. We also suspect it would be quite easy to substitute a less processed product for the white sugar called for in Ms. Farris's recipes.] If I'm making a pie, for instance, I first simmer four cups of berries, with just enough water to prevent scorching, for 20 minutes. Then I add the sugar and four tablespoons of cornstarch or tapioca, stir the filling till it thickens, remove it from the heat to cool, pour it into a shell, and cover it with a top crust. I put the pie in a 425°F oven for 10 minutes, then reduce the heat to 350°F and continue baking for 30 to 40 minutes or until the top is browned. The cooked and sweetened fruit is also delicious in pancakes, muffins, and such. This will be the last of the tomatoes to have survived the Late Blight, so enjoy these quickly! 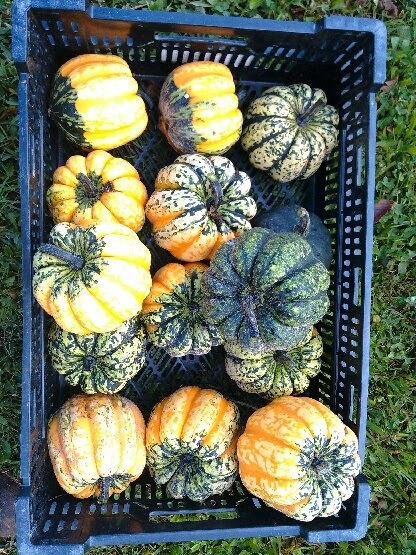 Below is a link to Farmer Figgins' post about all the varieties you will be seeing this season. Fortunately we do still have slicers and romas growing in the greenhouse which can be used very universally. We are growing a mix of White, Yellow, and Red onions, and everyone should see a mix throughout the season. Use the onions as you would any onion, we find the Red onions are best for strong flavors, and we like them especially for raw sandwich onions, yellows are very universal useable in any way, and whites are good for cooking with. These spicy summer favorites are coming free choice this week. We have a mix of peppers this week either a Jalapeno, Ancho, or a Bell pepper. Each has a little different use. Jalapenos, are typically added for spice to a dish, especially salsas, sauces, and stir-fry. Ancho peppers are pretty diverse and can be used diced, or stuffed and roasted. Bell peppers are probably the most universally liked pepper. These peppers are not typically spicy and even can be sweet. There is no wrong way to eat bell peppers in our opinion, diced it can be added to a salsa raw, or sauteed and added to eggs! 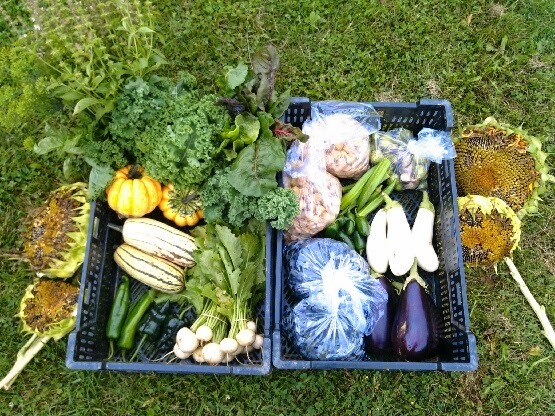 This will likely be the last share with summer squash, and we have a few monster size zucchini for everyone. These are large enough for making zucchini bread one of Farmer Figgins' favorite way to use squash! We shred and drain these large zucchini and freeze in 4cup batches so we can enjoy it all winter long. We've got bunches of Catnip, Sage, Italian Basil and Lemon Basil this week, enjoy!